Nehru Yuva Kendra Sangathan (NYKS) 225 Vacancies. Nehru Yuva Kendra Sangathan (NYKS) Has recently Invited Online Application Form for DYC, ACT and MTS Posts in NYKS, Across all over India. The Interested Candidates Can Read the Full Notification Before Apply Online Form. Candidate should have passed minimum Matriculation from a any recognized University or equivalent. The Candidates should have Post Graduate Degree in any discipline from a recognized University or its equivalent degree of B.Com of a any recognized university or Graduate Degree of a recognized University or equivalent with at least 2 year of experience in Accounts work. Typing speed of 30 w.p.m. in English or 25 w.p.m. in Hindi. The Selection will be totally depend on the basis of Written Exam marks only. Now go on “Click here for New Registration”, if you are a new user on this platform. LetsLe Complete the Registration and Click on “Submit”. After your successful Registration, Log in with Registered Number and provided Password. Fill all details in the application and upload Photo, Signature etc . Note-:Application fee should be paid through Online mode and then Submit the Form. Take a print out of Online application for your future use. 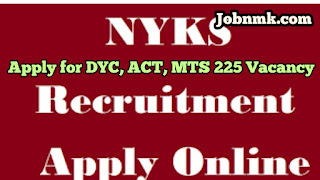 Nehru Yuva Kendra Sangathan (NYKS) 225 Vacancies.